Arrangement of Beethoven's "An Die Ferne Geliebte"
Here are two albums on MSR Classics that feature talented pianists not well known to the average concert-goer and record-collector. Happily, the reputations of both appear to be are growing though, oddly, their keyboard styles and demeanor seem at times to be opposites in many ways. New York City-born Gwendolyn Mok was a student of the late Vlado Perlemuter and it is therefore not surprising that she has come to be identified with the music of Ravel. Indeed, her live performances and recordings of his music have drawn considerable praise from across the globe. With this disc she ventures into quite different territory: she selects one of Beethoven's more challenging early sonatas, and a mixture of interesting works, all with some connection to Beethoven. Ms. Mok chooses, unwisely I think, to play the repertory on period instruments. I've never been in sympathy with the HIP movement: from various sources we know that most composers – Beethoven included – embraced advancements in keyboard (or other instrumental) technology as soon as they came along. Often composers were inspired to write new piano compositions when they heard or acquired a new, more modern sounding instrument. But let me end my nitpicking here and go on with the review, not least because the instruments on this recording actually sound pretty good: the reproduction of the 1795 Louis Dulcken pianoforte, used in the Second Sonata, is quite fine, and the 1868 Erard played in the Czerny Nocturne and Mendelssohn Variations is the one instrument here that sounds reasonably modern. The 1823 Broadwood, used in the Czerny Fantasie and Liszt An Die Ferne Geliebte transcriptions, is also a fine sounding instrument for its time. The Beethoven Second Sonata is a challenging piece to be sure and what a performance Mok delivers: she plays the first movement with brisk tempos and a deft sense for Beethoven's earthy humor, and while other pianists, like Brendel, Barenboim, Ashkenazy, and James Brawn (../m/msr01467a.php), play with a somewhat more suave and less aggressive manner, Mok makes her more vigorous way work splendidly, as she consistently captures the wit and energy, the effervescence and sparkle with all manner of nuance and gradations of dynamics. She certainly turns those upward runs in the exposition into the most delightfully mischievous sounding guffaws. Mok wisely chooses not to play all the first movement repeats: she does play the exposition repeat but Beethoven also asks for a repeat of both the development section and reprise! Including them all in a performance bloats this movement to the point where it can test a listener's patience. Still, I can't help but point out an irony here: if you play Beethoven on a period instrument apparently for reasons of authenticity, why wouldn't you play the work with the repeats the composer specifies? Mok delivers the other movements with the same keen insight and deft touch. In the end, I must declare this is a performance to rank with the best I've heard in recent years. While the remaining works are certainly interesting, one wishes another Beethoven sonata or two would have been included, because Mok seems a natural and very persuasive Beethoven player. But it's an understandable decision since MSR Classics has a very excellent ongoing Beethoven sonata cycle featuring James Brawn. Moreover, at least one of the other works here, Mendelssohn's 1841 Variations Serieuses, is quite substantive. It is a difficult work too and here lasts about eleven and a half minutes. Once again, Mok plays brilliantly, capturing the agitated drive and sense of restlessness with crisp articulation and astonishing digital nimbleness. The transcriptions of the six songs from An Die Ferne Geliebte are well crafted efforts by Liszt, and are convincingly played by Mok. The Czerny Fantasie is based on eight different Beethoven themes and the Nocturne was written as part of the Album – Beethoven, a collection of works published in 1841 to raise money for a monument erected in Bonn in honor of Beethoven. The Fantasie is of modest appeal but the Nocturne is quite beautiful. Both are, again, very well played by the pianist. The sound reproduction is excellent in all works. 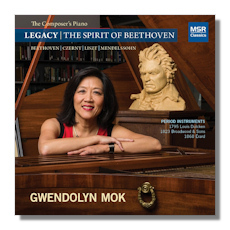 Gwendolyn Mok is a young artist with exceptional talent, and if the mixed repertory here appeals to you, this disc will certainly deliver rewards. 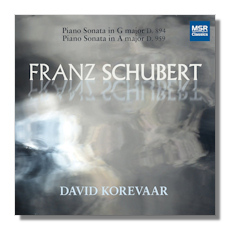 The second disc features David Korevaar in two popular Schubert sonatas. At the outset I suggested he was quite different in his style from Mok, and these Schubert sonatas divulge that difference quite markedly. Where Mok is vigorous and energetic, Korevaar is somewhat measured and probing, a bit restrained but always with subtlety and sensitivity to the mood and character of the music. Like Mok, he plays with a wide range of dynamics but generally tends to avoid big fortes. I found Korevaar a little more aggressive on his disc of Hindemith sonatas which I reviewed quite favorably here in 2015 (../m/msr01507a.php), and that would suggest he can be quite flexible in his style depending on the repertory. Korevaar sees Schubert here as mostly serene and contented, typically playing down the more fiery and urgent moments. He delivers the stately opening chords of the A major sonata (D. 959), for instance, by undercutting the usual epic character and sense of thrust with a sort of proud calmness and restraint. That manner often pervades both sonatas in fact. Try Uchida or even the often straightforward Brendel and you'll notice more power and dynamism, but not necessarily more majestic sweep. Korevaar ultimately makes an excellent case for his approach: he consistently interprets both works with a sense that Schubert indeed foreshadowed Bruckner and that the music here is not about power or defiance or a Beethovenian urgency. Korevaar's tempo choices are generally moderate, though his overall timings are comparatively brief, a result of eliminating unnecessary repeats: in the Schubert sonatas typically there are, let's face it, more than a few that come across as redundant. Korevaar captures the serenity in the opening movement of the G major sonata (D. 894) with a mesmerizing, silken tone, making Schubert sound more richly Romantic than is usual. The playful music later on conveys an infectious joy. Speaking of joy, the finale effervesces with it, but Korevaar isn't guilty of recasting the music as all serenity and happiness: the A major sonata's second movement main theme has a grimness and haunting sadness in its gentle manner, while the middle section, though less fiery than in many other performances, exudes unsettling stark power. In the end, one must observe that Korevaar's performances arguably have as much subtlety, color and character as most of the better efforts. Uchida may still be preferable, but Korevaar's understated way with the music offers a quite valid and persuasive alternative approach to these great sonatas. The sound reproduction by MSR is excellent once again. Highly recommended.